The Use of Children's Literature in Teaching reveals the impact of politics, professional guidelines and restrictive measurements of literacy on the emerging identities of young teachers. It places renewed emphasis on the importance of creative teaching with children’s literature for the empowerment of teacher agency to enhance the learning of their students. Framing the debate alongside the issue of teacher autonomy, Simpson describes results from a two-year study, which brings together information from interviews, surveys, document analysis and digital stories from Australia, Canada, the UK and the US to assess the role of children’s literature in pre-service teacher education. Through cross-cultural comparison, this research captures the different levels of connection between politics, education systems, higher education and pre-service teachers. It exposes how politics, narrow views of professionalism and program structures in teacher education may adversely affect the development of pre-service teachers. This book presents a strong case that reading and responding critically to literary texts leads to better educational outcomes than basic decoding and low-level comprehension training. As such, this book will be of great interest to researchers and scholars working in the areas of teacher education and literacy and primary education. It should also be essential reading for teacher educators and policymakers. 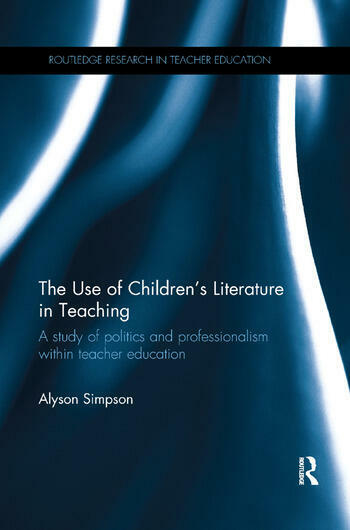 Alyson Simpson is Associate Professor of English and Literacy Education at the University of Sydney, Australia. As well as lecturing in pre-service teacher programs, she is lead author of Language, Literacy and Literature (Melbourne: OUP, 2013) and author of Reading Under the Covers: Helping Children to Choose Books (Newtown: PETAA, 2008).